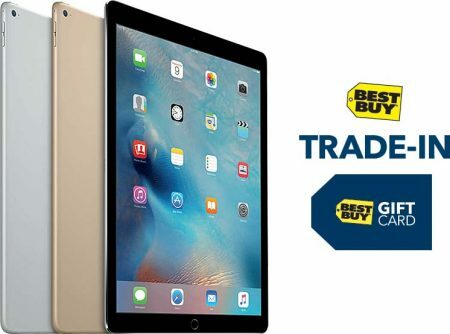 If you’re itching to upgrade to an iPad Pro but aren’t willing to pay full price for one, Best Buy has a great solution for you. For a limited time, shoppers can buy an iPad Pro starting at just $599.99 after trading in a working iPad Air or iPad Air 2 for a $200 Best Buy gift card. That’s an impressive deal, considering that the iPad Pro Wi-Fi 32GB has a regular price of $799.99. This offer is valid in store only from Jan. 10-23, and there is a limit of one trade-in per person. Visit the retailer’s website to browse full details and exclusions of this trade-in promotion. Check out our Best Buy Store Guide and Best Buy Sales and Events Guide for more ways to save at the tech superstore. Find this deal at Best Buy.